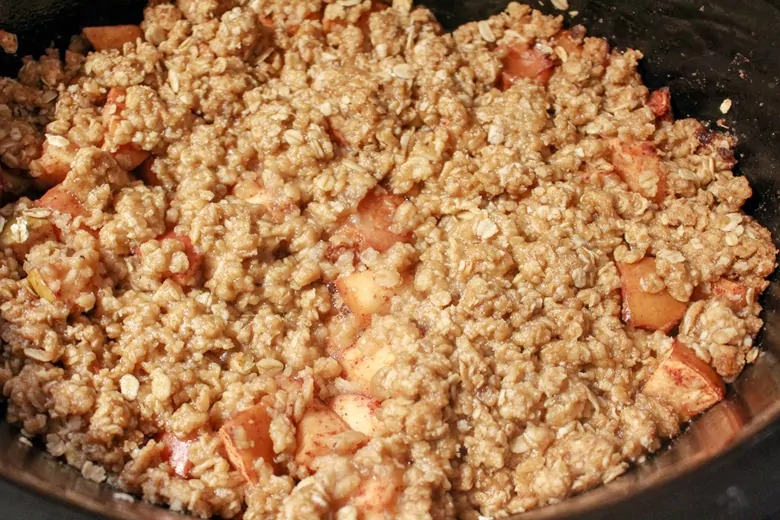 An easy apple pear crisp recipe made in the slow cooker. This warm and comforting Fall dessert is great on its own or served with vanilla ice cream. Yum! 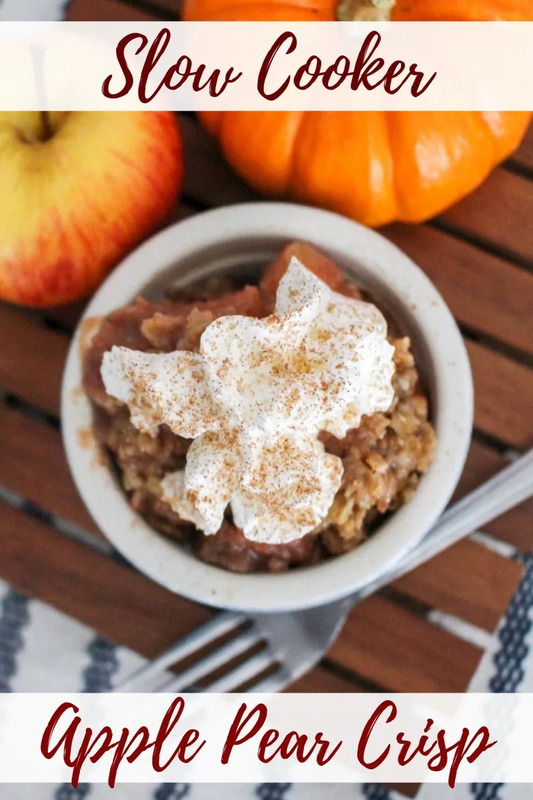 Looking for delicious apple recipes to enjoy this Fall? 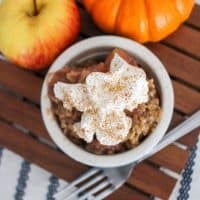 This apple pear crisp is amazing and, best of all, it is super easy to make in your slow cooker. Start by gathering your ingredients. For this easy slow cooker recipe you will need 3 apples, 3 pears, sugar, cinnamon, oats, flour, sugar, and butter. You will also need a bit of non-stick spray for prepping the slow cooker. Next, core and chop the apples and pears. You can leave the skin on the fruit or remove it. That is totally up to you. Mix together your cinnamon and sugar to make – you guessed it – cinnamon sugar. Combine flour, oats, brown sugar, and chilled butter to create the topping. Now comes a little trick to keep the crisp from becoming soggy while cooking in the slow cooker. 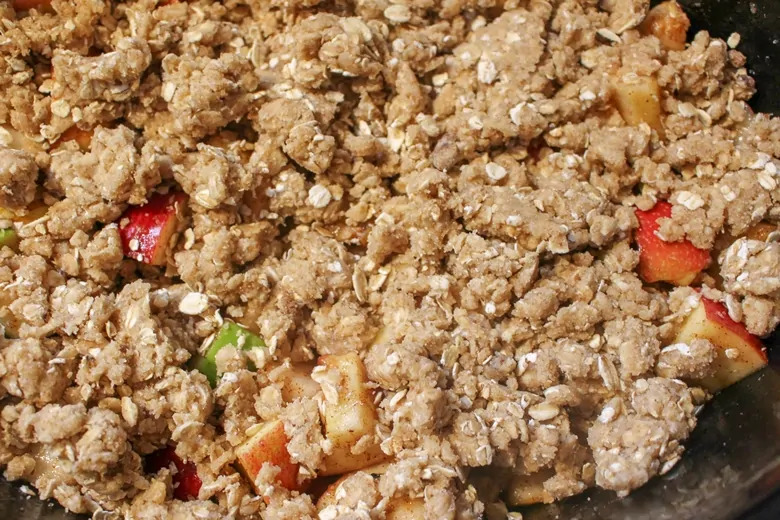 The trick to keeping this apple pear crisp crispy is… paper towels. Simply draping paper towels over the top of the slow cooker before placing the lid on will help to absorb moisture. The result is a nice and crispy topping. Cook for 2 hours on low and then cool briefly before serving. And while this apple and pear crisp is delicious when enjoyed on its own, top it with a scoop of vanilla ice cream or some whipped cream for a real treat. Or better yet, top it with a bit of both! The combo of the warm crisp with the cold and creamy vanilla ice cream is just heavenly. 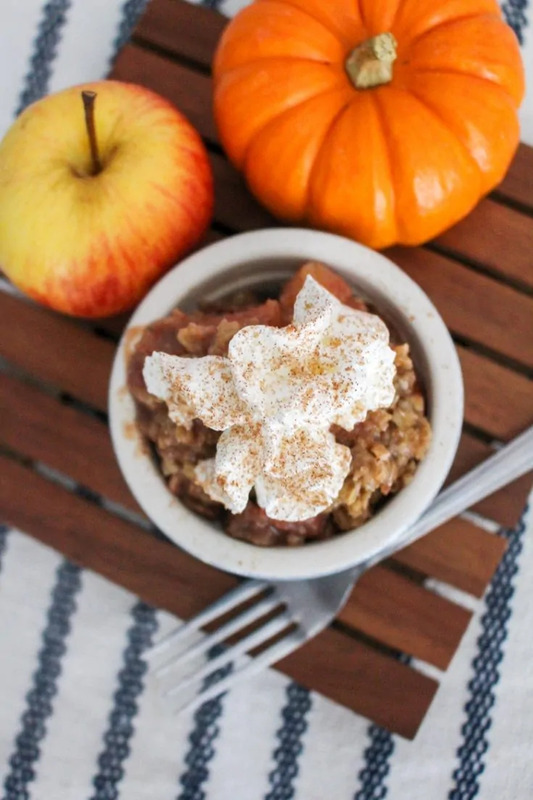 I hope that you and your family enjoy this yummy apple pear crisp recipe! This slow cooker apple pear crisp is a warm and comforting Fall dessert recipe that pairs perfectly with vanilla ice cream. Spray the inside of slow cooker with non-stick spray. Combine cinnamon and sugar; sprinkle a small amount to cover the bottom of the slow cooker. 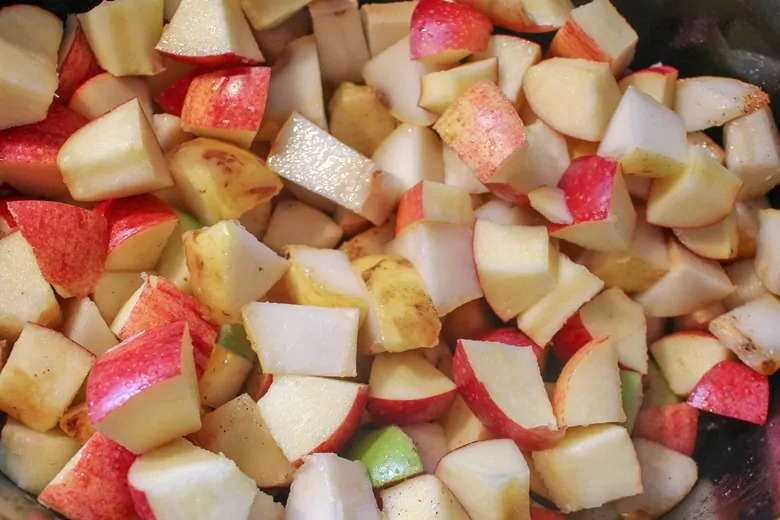 Add apples and pears to slow cooker. Sprinkle remaining cinnamon sugar on top of the fruit. 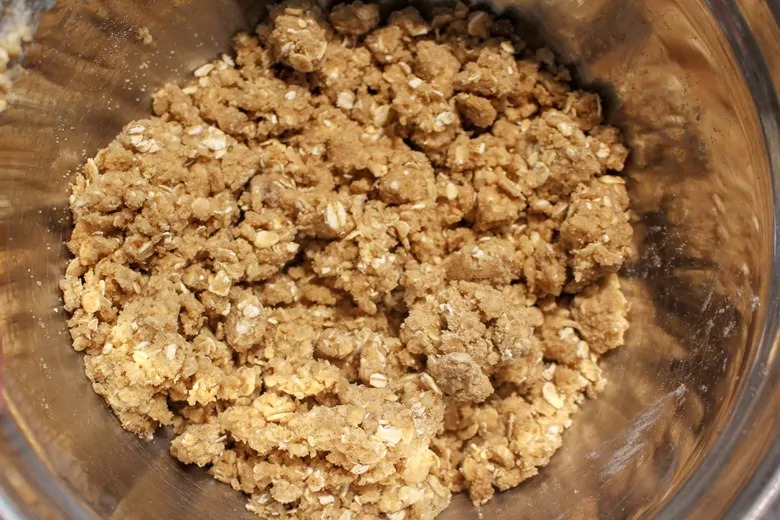 In a large bowl, combine oats, flour, and brown sugar. Mix thoroughly. 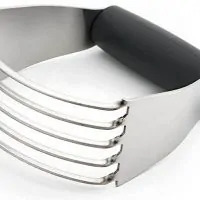 Use a pastry cutter or fork to cut the butter into the mixture until the mixture becomes crumbly. Sprinkle mixture over the fruit in the slow cooker. Drape a layer of paper towels over the top of the slow cooker and then cover with lid. The paper towels will work to absorb extra moisture, to help give the crisp that “crispness”. Cook on low for 2 hours. Allow to cool briefly before serving. Serve with ice cream, or whipped cream, if desired. Such classic flavors and I love that it’s made in the slow cooker…slow cooker recipes are the best and this crisp looks divine! I love that you have pears in this recipe too. I think apples and pears together is such a great combo this time of year! Great tip about the paper towels! I can’t wait to make this and fill my home with the smell of cooking apples, pears and cinnamon. This will be perfect for our next gathering. I’ve never made a crisp in a slow cooker. That’s got to change because this looks delicious. 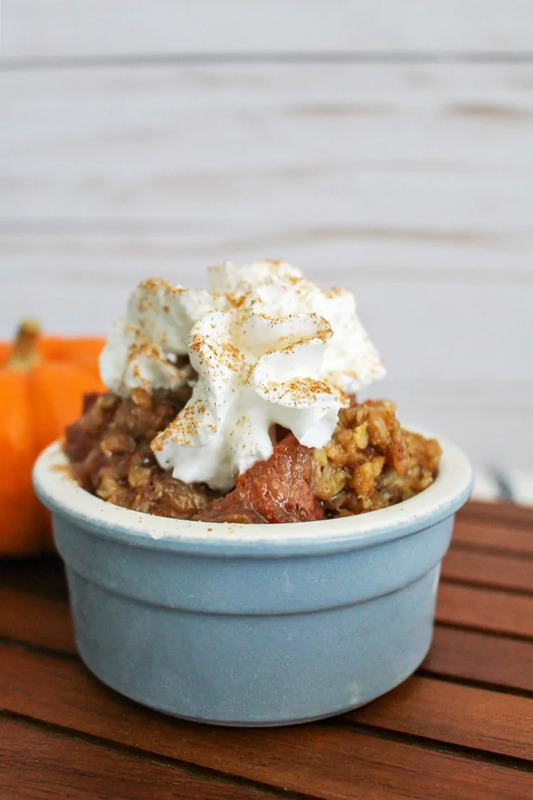 I love apple desserts and the fact that you made this in the slow cooker is just awesome!! Can’t wait to give it a try! Oh my! This sounds and looks delicious. This looks great, I love apple recipes and I could dive right into this now! I love this, my favorite dessert. Oh my goodness, this looks and sounds so delicious! Definitely pinning. Plus , I really love how fast this cooks and is prepared! Yum! Love the combination of apples and pears. Can’t wait to try this. This looks delicious! What a fun way to use the slow cooker! Perfect! I was looking for a new pear recipe this weekend, love the slow cooker!